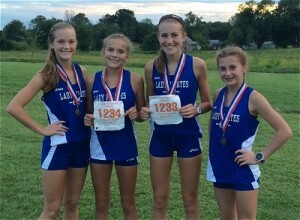 Charlestown High School Cross Country participated in the annual Clarksville Hokum Karem meet Tuesday evening. The Lady Pirates placed fifth as a team, with the top three team partners counting toward the team score. Highlight of the evening was partners Katie Rhodes and Carley Conway finishing in second place with a total time of 39:31. Coach Doyle commented that the time was the best Charlestown time he’d since in his five years of coaching the Pirates. Additional performances of note included Claire Mitchell and Kelsey Lakes finished 20th while receiving medals with Rhodes and Conway. Lady Pirates Piper Clark and Alexis Gurr placed 25th for Charlestown.